The Port Bar's BackSide Lounge can hold up to 80 people. Like The Port Bar itself, we believe it responds to a unique Oakland need, a spot for 40-80 people to gather socially in Uptown with its own bathroom, lighting & sound that's still connected to a cool destination location. As an Oakland grown, community focused business, The Port Bar encourages nonprofits, political organizations, and other companies to contact us about the use of the space. To date we've hosted 4 members of the United States Congress at once, 1 AirBnB CEO & more drag queens than we can mention. What? We're Oakland, we're diverse like that. "Karaoke for a Cause" is our way of supporting our nonprofit heroes by providing a drag queen, a DJ & proceeds from our beer & well wine sold on Saturdays from 6-9pm towards a beneficiary organization. Oakland is a town made of a diverse people, all who share in common their pride in Oakland’s celebrated history as a working class city with a rich history in activism from queer author Gertrude Stein to the first National Strike to the birthplace and home of the Black Panthers to Barbara Lee Speaks For Me. Our team convened focus groups in 2013 to ensure our hypothesis was correct, that Oakland needed a 7 day a week spot for LGBT folks. The Port Bar name came from these focus groups’ feedback. 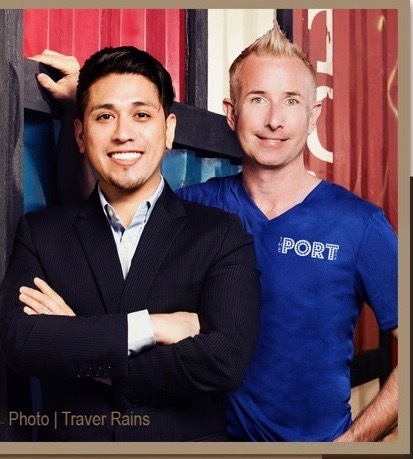 The Port Bar was founded by Richard Fuentes + Sean Sullivan. Both big believers in Oakland, Fuentes was named One of 40 under 40 by the SF Business Times in 2016 while Sullivan was named a "PlayMaker" by the San Francisco Superbowl 50 Committee. Both were named 1 & 2 of the "Top 10 people to Watch in 2017" by GLOSS Magazine. Sullivan, an award winning mixologist, manages operations & marketing of The Port Bar. Fuentes serves as CFO and oversees human resources. The permanent Art collection reflects 6 legendary LGBT Social Justice leaders by 6 Bay Area Artists of Color. These panels were meant to be temporary. However, they were so well received that they now rest above The Port Bar’s shipping container inspiring us as we look up and, hopefully, it's subjects looking down on us as carriers of their legacy with pride. The Port Bar hosts temporary exhibits launching each First Friday of the month. This artwork is for sale through connecting with the artist. 100% of the sale goes to the artist. The Port Bar resurrects Oakland’s past for the vibrancy of Oakland’s future through its design. Starting with the Mondrian inspired Shipping Container wall designed by Sean Sullivan all major design elements are repurposed from different parts of Oakland’s past that are all undergoing transformation for Oakland’s future. The wall and shipping container bathroom are constructed from real shipping container material from The Port of Oakland. The wood in The BackSide Lounge is from a former Army Barracks on the Oakland Army Base. The corrugated steel that wraps the bar, back wall and the pipes that hold up the bar shelves are all from covering over the former Capwell’s Emporium building while it was Sears. Similarly, The Port Bar sees itself as a docking station between the Oakland of the past, present and ready for its brilliant future.